After returning from his date, Stradlater reads the composition, then angrily tells Holden that it's no wonder he's getting expelled: he doesn't do anything "the way you're supposed to." Holden rips up the assignment. Stradlater knows how to play the "game," but he's also clearly less intelligent and less sensitive than Holden is. Holden starts smoking a cigarette in the room just to annoy Stradlater, then asks what happened on the date. Stradlater refuses to say. Holden tries to punch him. Stradlater wrestles Holden to the ground. Holden insults Stradlater, who punches Holden, bloodying his nose. Holden clearly hates the idea that anything sexual might have happened between Stradlater and Jane. His defeat here symbolizes the larger fight he will also lose against growing up. After Stradlater leaves, Holden puts on his red hunting hat and looks at his face in the mirror. He thinks the blood makes him look tough, though he's a "pacifist." Putting on his "people hunting hat" is an act of defiance but also alienation. Still, Holden recognizes his own "phoniness." Kestler, Justin. "The Catcher in the Rye Chapter 6." LitCharts. LitCharts LLC, 22 Jul 2013. Web. 9 Nov 2018. Kestler, Justin. "The Catcher in the Rye Chapter 6." LitCharts LLC, July 22, 2013. 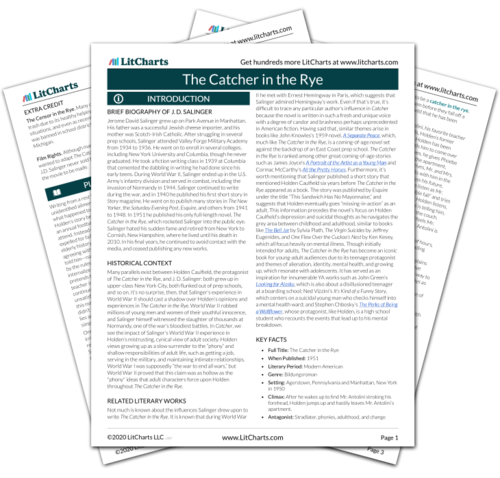 Retrieved November 9, 2018. https://www.litcharts.com/lit/the-catcher-in-the-rye/chapter-6.